George Evan Mills was born in Llandeglau, Radnorshire, Wales in 1855 / 56. He worked for the Maskelyne and Devant Magic Show for some years. When he left he took to a street pedlars life, travelling up and down the North West coast of England and Wales. He made playing cards for magic tricks and the dancing peg dolls which he sold on the streets. A couple of years ago John Earl, who is a descendant of George Evan Mills, passed an old leather Doctors style bag on to Jim Eldon. John knew that Jim made wooden toys and puppets and was also steeped in the tradition of street entertainment. He thought Jim would know what to do with the contents of the bag. On further investigation the bag contained dozens of Peg Dolls in various stages of construction, printing blocks for playing cards and printed instructions for the peg dolls. The peg dolls were crudely but efficiently made from two dolly pegs, nails, small strips of wood and simply decorated with a touch of red and black dye to distinguish the pairs from each other. Jim showed the bag and its contents to me. I was amazed. I had seen peg dolls before of course. But never this ingenious use of them. It was sometime before we took some of George’s peg dolls out to perform with (Jim and I play fiddles and perform together sometimes as ‘Two Straylarkers’). It was in Retford Town Hall at a family folk day event that we tried them out. We were struck, as were our audience, with the beauty of the peg dolls. When made to work with music to accompany them the former dolly pegs become magically transformed into jaunty little couples, dancing, clogging, skipping and jumping in time to the music. They echo each others movements as they become animated tiny people. At the time of writing I have not met many people who know of this ingenious toy and it seems that up until now they have almost been lost to history. Enchanted by the peg dolls I decided to begin constructing my own. 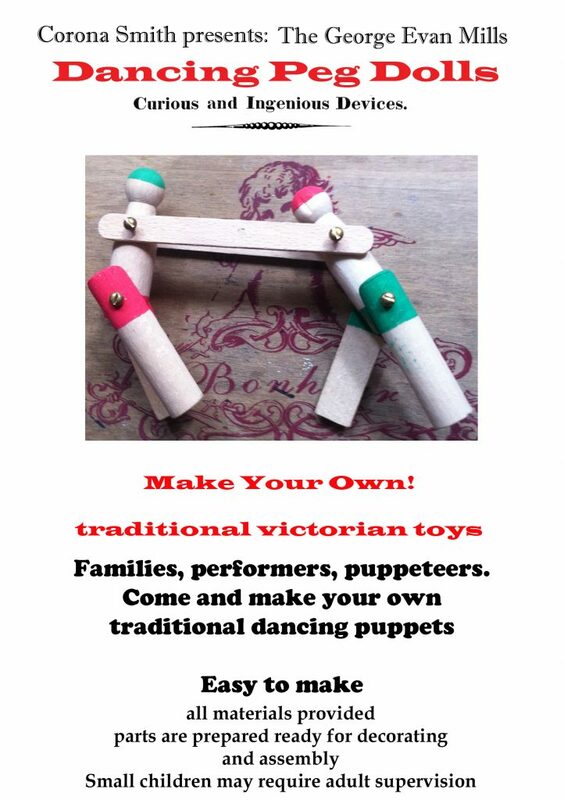 I persuaded Jim to part with a pair of George’s original peg dolls and set about making copies. I also began decorating my peg dolls with more detail, creating characters. Friends and couples, Dennis the Menace and Softy Walter, A pig and a politician, Acrobats, Ninjas, The Earth and the Moon, A Nun and a Penguin, cops and robbers …… etc etc…. People also began to ask me to make peg doll dancers in their likeness, which I of course am more than happy to do! It gives me great pleasure to re-introduce this toy to the public at large and I encourage you to construct your own and have fun with them.